Aloha Mixed Plate had been recommended by several people I know. The bad part is, that all those who recommended AMP had really not had a "good" plate lunch before. On the positive side, if it tastes good and is well prepared, it's still ono, right? 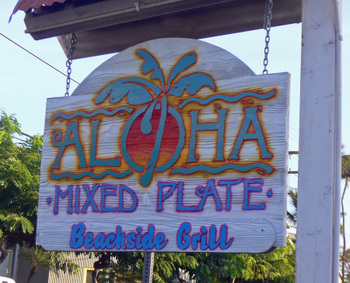 Aloha Mixed Plate is located right behind the Maui Cannery Mall on Front Street. At first we thought we'd grab a couple of Banh Mi at Ba-Le in the mall, but I must admit I kinda freaked out....Banh Mi was going for four bucks, each! Ouch. So we decided to give AMP a try. After walking up the stairs to the dining area and having a seat...we waited, and waited...finally deciding that perhaps we should get a take-out order. We placed our order and after a short wait drove back to the condo. These weren't bad, but fell short on flavor. 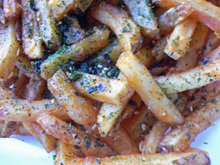 I had thought this would be a really good combination, and I'm still sure it could be, but it would need to have more furikake and garlic. To be honest this is about "Chinese" (the menu didn't say Chinese-style or Local style Chinese, but Chinese) as anything that Paul Fleming "Chang" would cook up, with very little five spice flavoring. 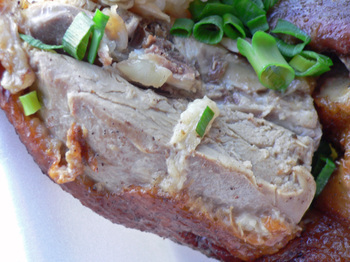 The duck was not bad, though. 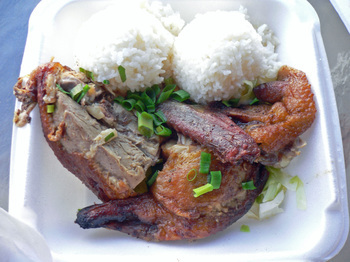 The portion size was pretty good, and the meat while a bit tough, had a decent duck flavor. 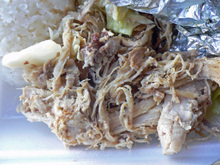 First off the Kalua Pork was terrible...dry with no flavor. You can tell by the color, it was very bland. Tasted like boiled pork. 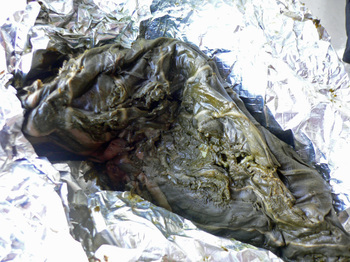 The Lau Lau on the other hand was not bad, even though it looked like it was steamed in foil. 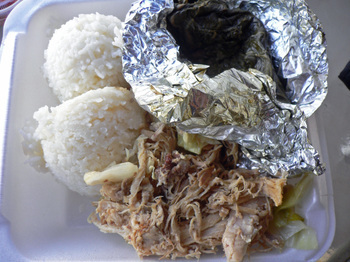 The pork had absorbed the flavor from the luau leaves, and was moist. No butterfish or salted fish in this version, and especially no piece of fatty pork, I think the Lau Lau was kept tame to not freak out any tourists. The Lomi Lomi Salmon was not very good, much too fishy. Too much tomato, not enough onion, and lousy fish. 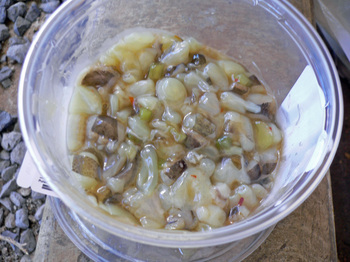 The poi was runny, and weak, but the Haupia, even though it really had a more pudding like texture tasted pretty good. 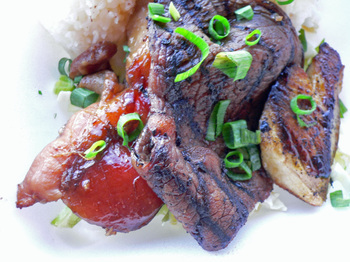 The Shoyu Chicken had a nice flavor, but was tough and very dry, same with the Beef. 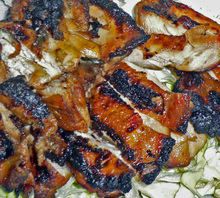 You could tell it was marinated with local-style teriyaki...not as sweet, and with hints of ginger. Much to my surprise, the Mahi Mahi(Dolphin-Fish/Dorado) was pretty good, with a nicely grilled crust, and very moist, and not hint of any off putting fishy flavor. By Lahaina standards, the prices at AMP are pretty reasonable, though in our opinion not as good in taste and quality(it's cheaper, though) as Honokowai Okazuya & Deli . There is a Japanese tradition of giving gifts when returning from a trip, these gifts are called Omiyage. 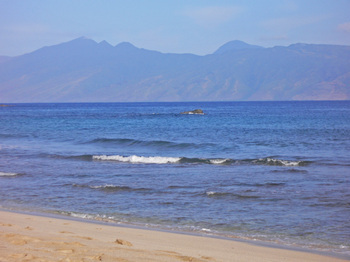 In Hawaii, the tradition is deeply rooted, and goes beyond ethnic and cultural differences. 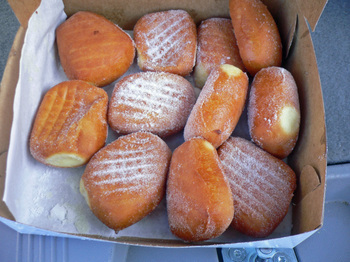 In fact, when making a trip from say, Honolulu, to Hilo, your mind automatically starts ticking off what you need to bring back for Omiyage...., Mochi from Two Ladies Kitchen, or something from Big Island Candies. The tradition even works in reverse; when taking trips to Lanai, Manapua(sort of a steamed Char Siu Bao, but bigger), Pork Hash(Siu Mai), and Pepiao from Char Hung Sut was a required gift. Maui seems to have more than it's share of Omiyage items, though the list seems to be getting shorter(of the stuff I know) as time goes by. 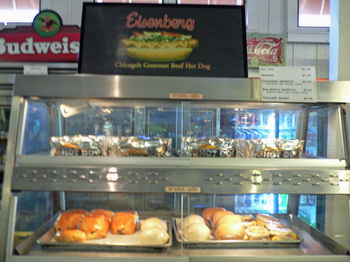 Long gone are the Maui Hot Dogs and Shishido Manju. But several sources of Omiyage are going strong. 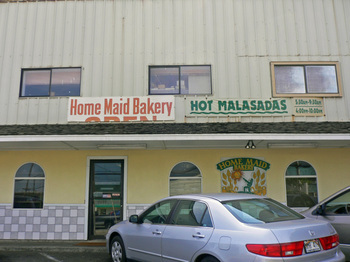 One of those sources is located in Wailuku on Lower Main street, Home Maid Bakery. The bakery is not that hard to find, but parking can be. Though it might not be a long wait since cars are always leaving as quickly as they are entering the hilly, uneven, slightly pot-holed parking lot. 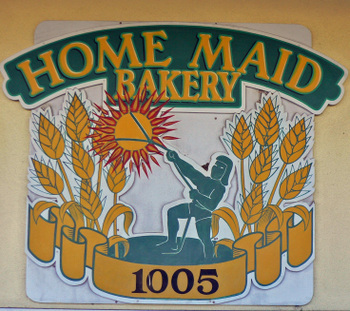 And Home Maid's hours are very convenient, they are open from 5am to 10pm daily. But what Home Maid Bakery really is known for are the Crispy Manju, which unlike traditional Japanese Manju, has a crisp pastry crust (Think pie crust). So I had to make sure to buy a couple for snacking pleasure. 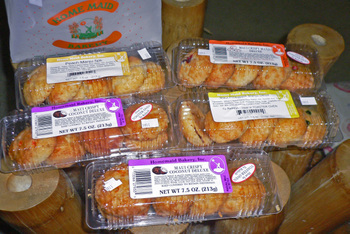 I picked up the Imo (sweet potato) and Crispy Manju Deluxe(lot's of azuki). 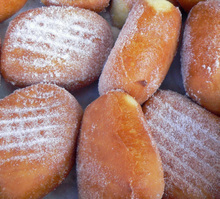 The Missus really didn't care much for them, She's much more of a traditionalist, and while I still enjoy the buttery sweetness, I thought these seem to be much more greasy than I remember. My Mother In Law on the other hand, who obviously eats this much more often than we do(living in Honolulu) loved them. And we made a stop on the way to the Airport so they could grab a good selection as Omiyage for their friends and the people at work. The MIL says, the Coconut is really good. 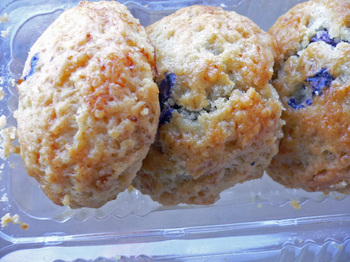 So on your way to the airport, don't forget the Crispy Manju from Home Maid Bakery. 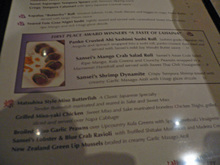 For our one "big" dinner, we decided to stick close to Kapalua, and have dinner at Sansei. 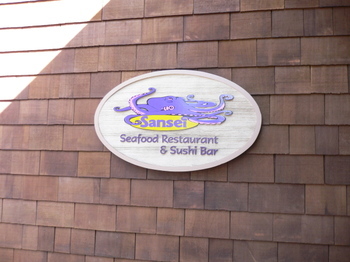 I'd always wanted to check out Sansei, I just never thought that it would be at the Kapalua location. 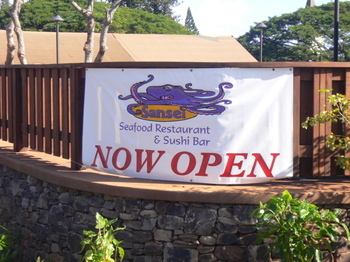 Sansei had recently moved up the road, and now was right next to the Honolua Store. In fact, there was still a minimum of signage to identify the restaurant. For those that don't know, the word "Sansei", is Japanese, and literally means "Third Generation". And is the creation of D.K. Kodama, a Third Generation(hence the Sansei) AJA Chef and Restauranteur. 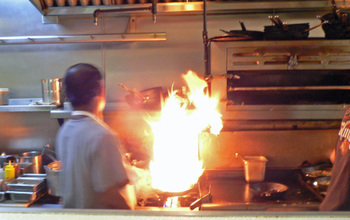 The cuisine is a called Japanese-inspired Pacific Rim Cuisine, aka "fusion". Pacific Rim fusion when done well, is eye(and palate) opening, and innovative. But when done poorly, as with most restaurants jumping on the Pacific Rim band wagon, the food is gimmicky, the flavors confusing (what I call, con-fusion cuisine), and is just plain terrible. As we walked toward the restaurant, I was really glad that I had made reservations; there was a pretty long line out the door. It was 630 pm on Thursday, and all three dining areas, the sushi bar, and the lounge was packed. The Hostess was informing people walking in hoping to score a table, or a seat at the sushi bar that there was a 45 minute wait. We had a short wait and was shown to a nice little table. Over on the next table were a tourist couple. The matching His and Her Big Flower Aloha attire, and the very, very, bad (think lobsterville) sunburn was a real giveaway. During the evening, this young couple provided us with some amusement. 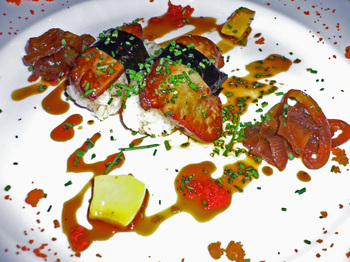 We could hear them asking the Server, "what is this shish-shimi", and "ewww, that's goose liver!" he-he-he. Our Server was named Todd, actually it was Todd #1, I'll explain later. We decided to go the "small plates" route and placed our order. I need to apologize, we had so much stuff, that I didn't really keep track of the prices, but I'll let you know the total later. Also, the photos aren't the best, and because everybody was taking photos in this really dark restaurant, we really didn't feel bad. 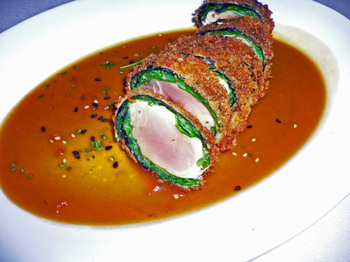 The Panko Crusted Ahi Sashimi Sushi Roll, the menu said that this was a "must try" item. 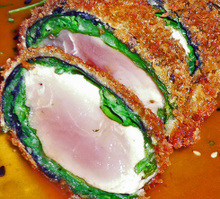 This "roll" is Ahi, wrapped with Arugula, and Nori, crusted with panko and deep fried. Apparently this roll had been lying around for a bit, it arrived in less than 5 minutes, the panko crust was cold, the fish over cooked, though I loved the flavor that the arugula brought to the dish. It was served with a very tasty Soy Wasabi Butter Sauce that I could have eaten with a whole bowl of rice. Sansei's Ahi Poke and Sweet Maui Onion($11), I was really looking forward to this. 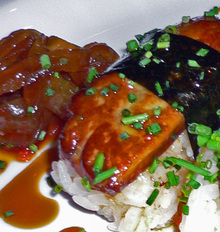 Just the thought of sushi grade fish combined with Maui onions! The unfortunate truth was.....train wreck. First off, there was way too much Togarashi, so the dish was so very lip burning spicy, that you really had a problem tasting anything. The Wakame was too tough, like eating rubber, and all the cucumber pseudo-Kimchi added was to make it sour. This is a "baseline " dish for the Missus, since I've been making Misoyaki for years using my Mom's modified recipe. 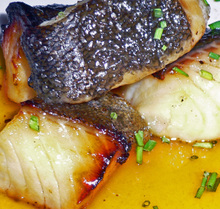 So whenever we visit a restaurant, the Missus will go for the Miso Black Cod. I once sat in amusement, while the Missus told the Uber-Yuppified Server at Matsuhisa, "my Husband's Miso Black Cod tastes better than this"! When this arrived at the table, I was a bit apprehensive. It looked under marinated. But one taste erased all doubts. 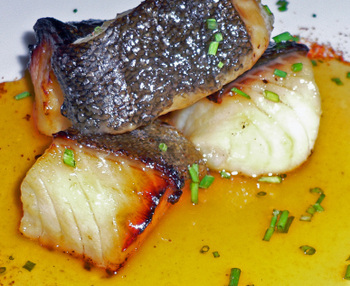 The fish was super fresh and moist, the flavor, a combination of sweet-salty-umami, was in perfect harmony. The Missus cleaned it up, skin and all, and it was all I could do to stop Her from licking the Mirin based sauce off the plate. Her favorite dish of the night. 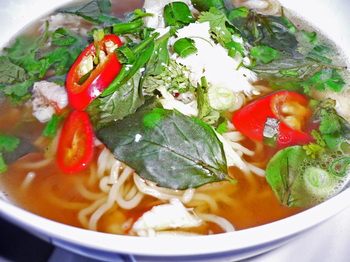 Too much going on, the heat from the red chilies and the strong basil flavor nullified any possible Truffle flavor. The broth was nothing special, and the noodles were mushy. The Dungeness Crab had no taste. The Kenny G, slices of Onaga(Ruby Snapper), in Ponzu Sauce, over a bed of grated Daikon(oroshi), topped with Masago(Smelt Roe), and a fine julienne of Thai Basil. Like hearing a constant loop of a Elevator-Muzak version of Songbird, this was a very uninspired dish. The snapper was dry and tough, the oroshi just made the dish bitter, too little ponzu sauce didn't help matters, and the combination of "all of the above" with the Thai Basil, gave the dish a medicinal taste. 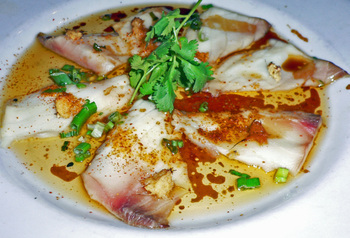 Hot oil is drizzled on thin slices of Opakapaka(Hawaiian Pink Snapper) with soy sauce and a touch of sesame oil. This is a good example of how good fusion can be when it works. The only gripe would be that I'd like my fish to be more rare. 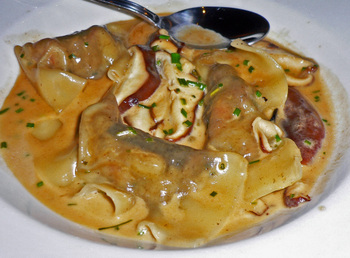 Todd's second recommendation was the Lobster & Blue Crab Ravioli, served in a Truffled Shiitake Mushroom and Madiera Cream Sauce...whew, what a mouthful! The Ravioli were good, the crab meat sweet, and the lobster meat adding a great texture to the ravioli. The sauce was a bit over the top and rich, but pretty good overall. I couldn't help myself and ordered the Tako Shiokara($5). As the dish arrived Todd told me; "You're lucky, this is the last order we have........the rest is being used as bait tomorrow!" Ba-Dum-Dum. As Shiokara is concerned, this was very tame, lacking the heavy fermented-fishy flavor of Shiokara. As an appetizer, this was pretty good. 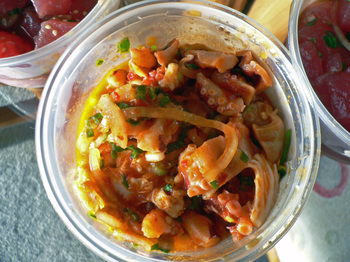 I was surprised at how the Kimchee sauce worked so well with the raw Octopus. All told our meal + 1 small Sawanotsuru Zuicho Daiginjo(smooth....) the bill came to $120 without tip. We didn't think the prices were too bad considering all the stuff we ate. A quick word on Todd#1, he did a great job. We could tell that he was absolutely slammed, but he always had time for us, had a great sense of humor, did a great job explaining the dishes, and was very efficient while being unobtrusive. What's in the name? Apparently at one time there were up to 6 "Todd's" working at Sansei, so they gave each one a number..... So on this visit we got the one and only original Todd. 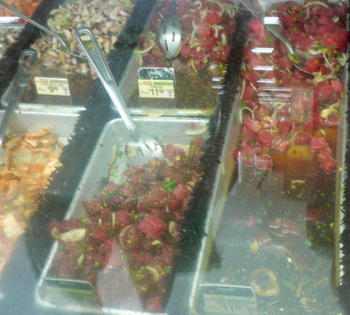 Which lead to our first stop for Poke....Safeway(yes, Safeway) Kahului. We marched into Safeway, and searched for a Fish Counter. 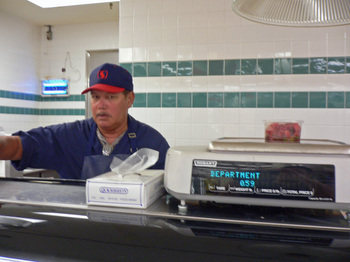 The Market has to have a fish counter. 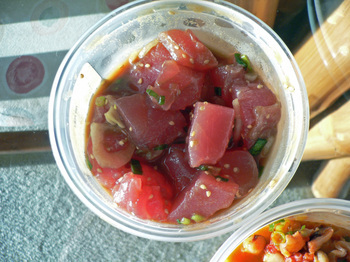 Sorry, but prepackaged Poke won't cut it with me. 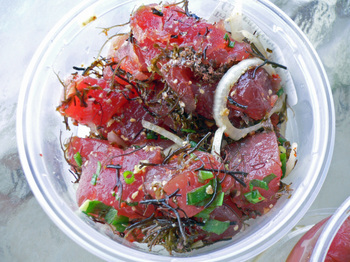 The Ahi Poke(Yellowfin or Big Eye Tuna). Dry and a bit off tasting. 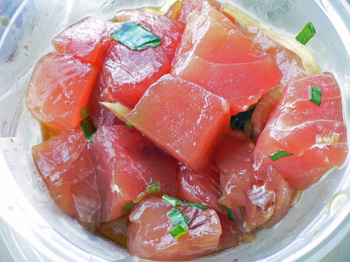 Aku is known to be a "fattier" Tuna, and thus will have a stronger flavor. This poke had alot of the white tough and inedible connective tissue. It was also on the "dry" side. Not very good at all. Makes me think I maybe shoulda tried the Poke made with the previously frozen fish? One of the Missus's new obsessions; Tako Wasabi. Raw Tako marinated in a slightly sweet-wasabi marinade, this was as good as any I've had. Even though the Poke was lousy, we did a return visit so the Missus could get Her Tako Wasabi fix. The service was rather disinterested, and this really did show up in the flavor and quality of the Poke....Auwe! So having been truly disappointed, we started asking around....and got alot of "this place makes good sashimi", and that sort.... 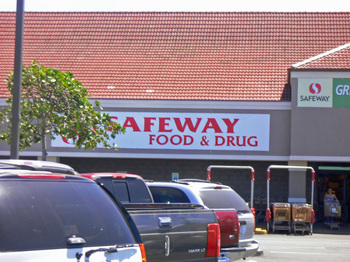 Finally, a few locals recommended Safeway, but "not da' one stay in Wailuku...but right hea' in dis mall". 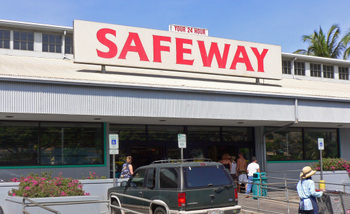 Which happened to be the Lahaina Cannery Mall. By this time we were a bit doubtful, until we marched up to the fish counter, and started ordering. At which time this Gentleman put the brakes on the ordering. He froze me with His steely gaze, and said "how do you know what you like, if you nevah' tasted?" And held up samples of the different versions on toothpicks. He went on to explain on how he made each version, how fresh everything was; "we get da' fish at 430am, clean 'em and......." Now this was a Guy who was proud of the fruits of His labor! Very clean and refreshing, with flavors of the ocean. The fish was fresh, and the texture(crunch of the Limu, meatiness of fish) pretty good, though the Missus thought it was under salted. The Ahi Shoyu was by far the Missus's favorite, to the tune of going back for this four times. 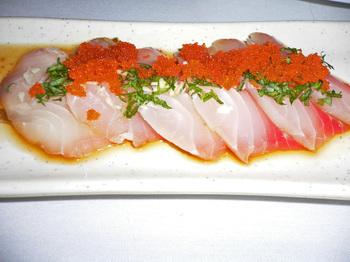 Great balanced flavor, not too salty, with a touch of sweetness provided by the uber-fresh medium quality fish. 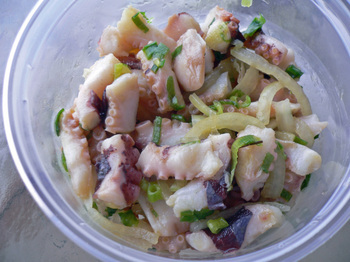 The Missus didn't care for the large pieces of Tako, but I enjoyed the sweet onion. 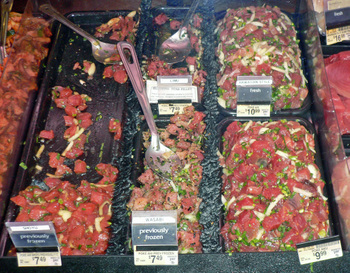 The Ahi Poke was my personal favorite. 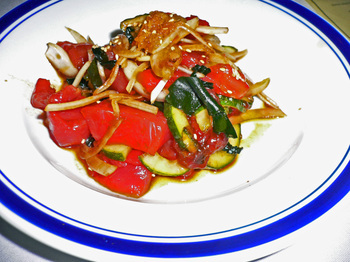 This Ahi Poke was updated with the flavor of wasabi, so it had a slight kick. Delici-yoso!!! Well how's that? Two Safeways, two different Fish Counters, big difference! 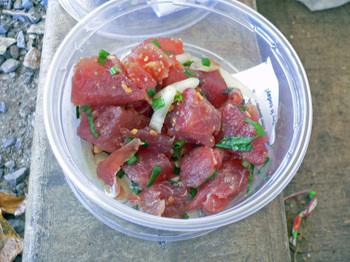 For more info on Poke; Alan, who does the Food Blog Ma'ona has written what I think is probably one of my favorite posts ever on Poke. 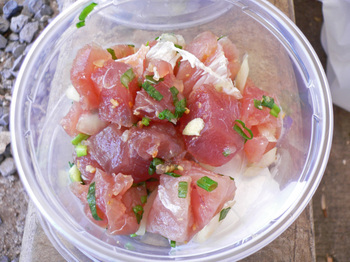 And just for the heck of it, here's my humble Poke Recipe. One morning the Missus, My MIL & FIL decided to take a walk down at the end of Office Road. 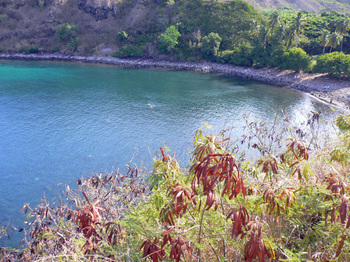 We walked along the edge of the Golf Course which featured a nice view of Fleming's Beach. 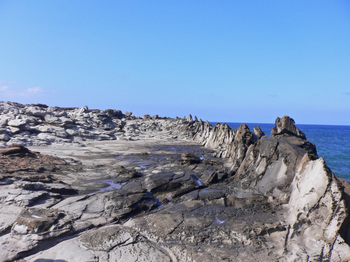 After skirting along the edge of the Golf Course we came to the lava formation called Dragon's Teeth. 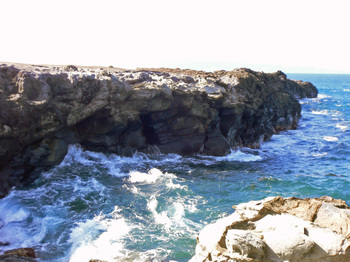 Created during one of the last lava flows on Maui, the forces of the wind and sea created this novel lava formation. This pleasant little walk provided glimpses of nature's, and man's creations. As viewed by this maze we found. 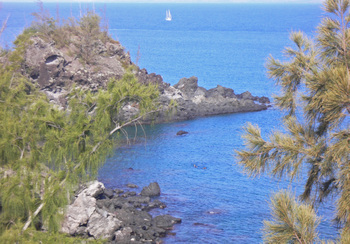 At the end of the walk is Makalua-puna Point, capping off a walk with the glorious view of the ocean's power. If taking this walk please respect the Honokahua Preservation Site, where ancient Hawaiian burial sites were discovered when ground was broken for the construction of the Ritz Carlton. In it's time the discovery created quite a stir. 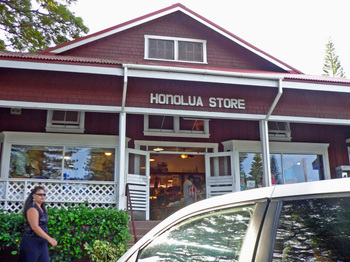 Located right next to the Kapalua Villas Reception Center, is the Honolua Store. As I walked to check in, something clicked, and I turned and took another look. 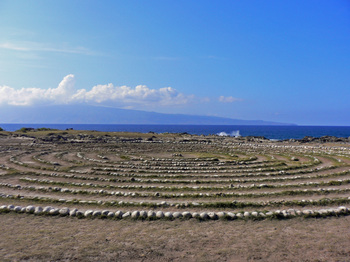 And yes, it was the Honolua Store that I remembered, though when I last saw it, it was on a dirt road, and green washed. Now it's right up the street from the Ritz Carlton! Times sure have changed. In fact, I remember the reception center as well, it used to be the Post Office. You see, my Mother was born and raised in Honolua Town. The last time I was in the area was circa 1969, by the early seventies my Grandparents had moved out of the area, but I have some really fond distinct memories of the area. How much of it is based on a child's view of the world, I'm not quite sure, but they are some really nice memories. For this trip, the Honolua Store is probably the only place to get reasonably priced "grindz". 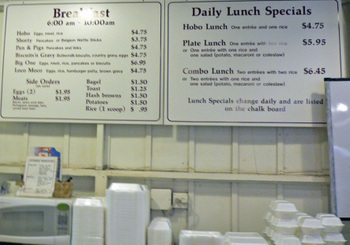 Yes, you can get breakfast for under five bucks...on Maui!!!! The service at breakfast can be rather surly, much of it due to "tourist burnout". But most items are located precooked hot table items, and your eggs, and other items are cooked up fresh to complete the breakfast. The are also "quick" items, ala' convenience store, that are available. As you can see, there are items for both the locals, as well as guests of the Ritz. 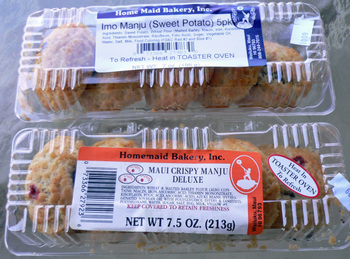 Manapua and English Muffin Sandwich, anyone? 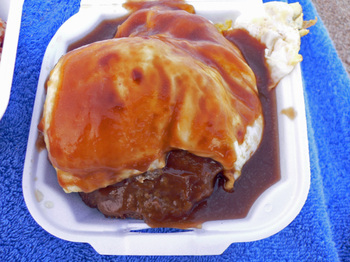 A Loco Moco($4.75) of course. 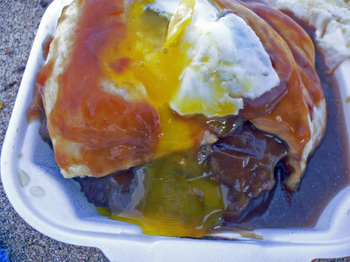 It was pretty good, the eggs(2) were done a nice easy over, the gravy had nice flavor, though the hamburger patties were bland and "mushy". 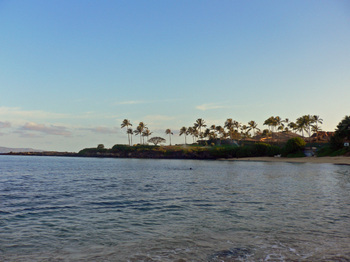 This is Oneloa Beach(aka Ironwood), at 730 in the morning. Not a place to swim(the Missus still tried...sigh), but a pretty nice to have a peaceful quiet breakfast. Which is what I did while the Missus was collecting strawberries on Her knees(I warned Her...). 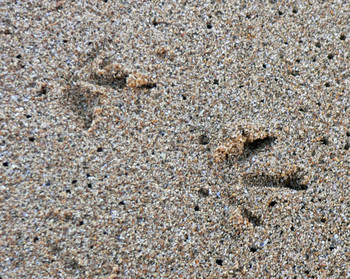 It was the second beach of the day. 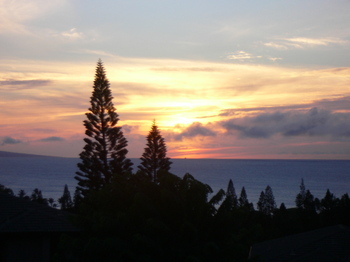 Every morning, still caught in the web of Pacific Standard Time, we'd be up at 5 or 530 am, and end up hitting Kapalua Beach by 6am, where the Missus would get Her morning swim in the calm protected bay, and I'd do some light running or go snorkeling. 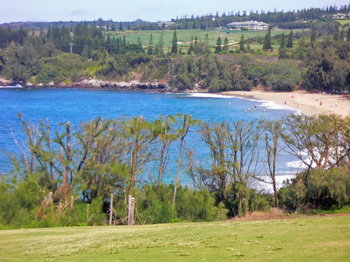 Kapalua Beach is alot smaller than it seems in the photos, and the small parking lot can be rather hard to find. You need to look for the large Napili Lani sign, and the parking lot is right before the sign, right past a fire hydrant. Usually we'd just be leaving as a few people would start arriving. 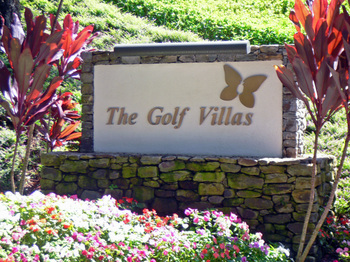 The afternoon had been rather stressful, we filed a police report, drove to Kapalua and checked in, and went shopping for replacement clothes, and other items(talk about sticker shock!!!). Before we knew it, we had missed lunch, and the sun had gone down. So on the way back from Ka'anapali, we took a left on Lower Honoapiilani Road and made our way to Honokowai Okazuya and Deli. 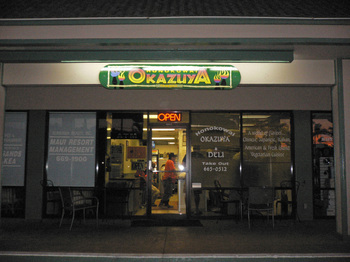 Honokowai Okazuya & Deli is located in a strip mall(my favorite place for eateries), next to a storage rental facility. In fact, I think the strip mall is called AAAAA Rent-A-Space Mall! HOAD, is not quite what I would consider a "local style" Okazuya to be, but more of a plate lunch place. And this little hole in the wall was quite busy. 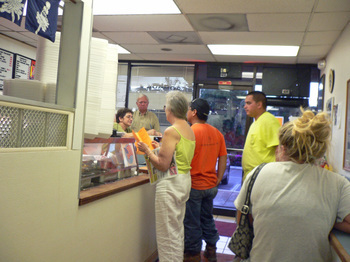 The place is so tiny, with only a few stools and a small counter, that most of the orders are for take out. 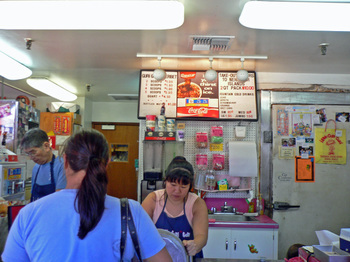 There were quite a few people manning the various stations in the kitchen, readily visible while waiting for our order. And the smells were very tempting. 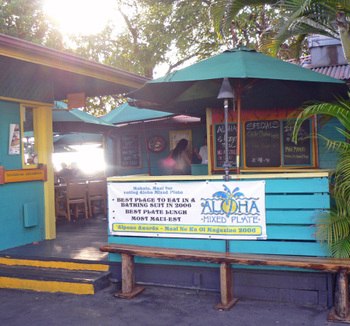 HOAD's menu runs the gamut, and straddles the line between pleasing both the locals(Chicken Katsu, Beef Chow Fun), as well as the tourist, and other non-locals (Mahi Mahi Lemon Caper, Pasta Primavera). There is a bit of sticker shock here as well; when we walked in an order of four plate lunches was rung for...for nearly Fifty-Five bucks!!!! But when placed in context with the prices at other places; we saw a Guy at Star Market buying a premade sandwich, some chips, and Miller Lite for over twenty bucks, the prices were fairly reasonable. So we placed our order and headed back to our rental Condo. 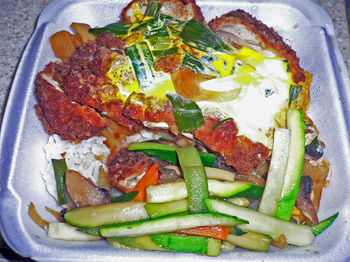 The Missus went with the Chicken Katsu Don($8.75), with Stir Fried Vegetables(.95 more). The Missus has a current obsession with Chicken Katsu Don, and was overjoyed at seeing it on the menu. She also thought is was good, the Chicken Katsu was still crunchy in certain areas, the egg, though a bit strange looking was nice and light, and most surprisingly, the sauce had a good, slightly sweet-soy flavor. But the Missus thought the stir fried veggies was the best item on the (styrofoam) plate. Sauteed over high heat(it was what being cooked in the photo above), with a mild Chinese fermented black bean flavor, the combination of Zucchini, Red and Green Bell Peppers, and other veggies was seasoned perfectly, moist, and indeed quite good. 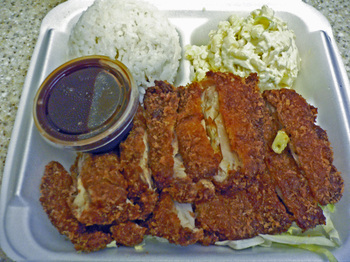 I had my old standby, the Chicken Katsu($7.95). The white meat chicken was still moist, and fried to crisp perfection. I didn't care for the Katsu Sauce, it was much too sour, but the macaroni salad was excellent; the optimal amount of mayo and egg, with enough salt for a change. I was impressed with the attention paid to the side dishes. 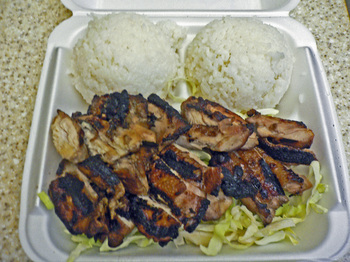 We also ordered the Korean Style Chicken BBQ($7.95). Mildly flavored, it was much to dry for me, but the Missus enjoyed the texture and flavor of the chicken. 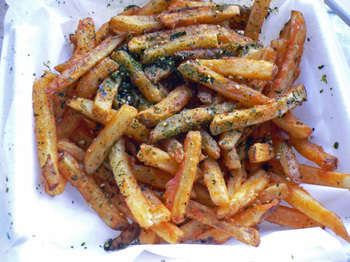 I understand that the former Owner of HOAD was a Chef at Mama's Fish House, considered by many to be the best restaurant on Maui, and the current Owner has been faithful to the recipes. 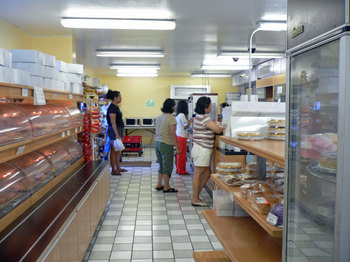 As it stands the Honokowai Okazuya & Deli is an oasis of reasonably (for Maui) priced food on West Maui. So where did we stay? 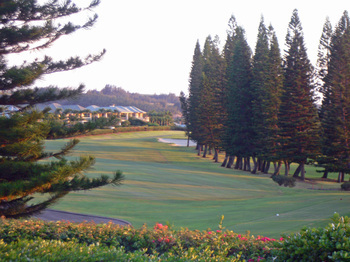 I found a really good deal on a large two bedroom Condo at the Kapalua Villas. And the ocean...talk about great sunsets! 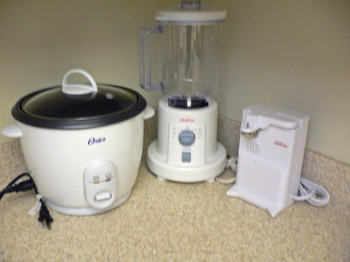 But most importantly, each unit had a full sized kitchen with cooking and table ware, appliances, and this one even had a rice cooker. All the units are managed by the Ritz Carlton, and the very unobtrusive service(we really didn't want to be bothered anyway) was good. I had gotten the unit at half price, and was very pleased. I must admit, you all are a sharp bunch. 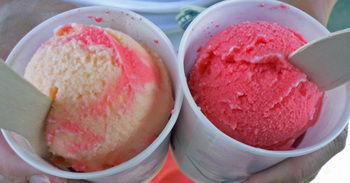 Yes, it is Maui, and yes, that was a really nice little cup of Guri-Guri(2 scoops/$1). 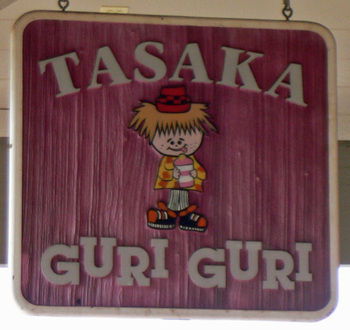 And on Maui, the "only" place for Guri-Guri is Tasaka Guri-Guri. 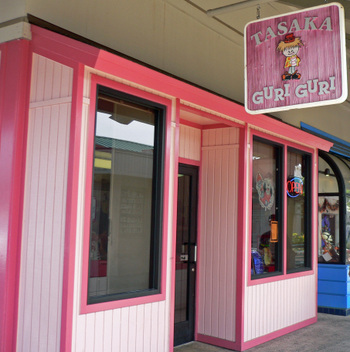 Located in, of all places, the Maui Mall in Kahului, the Tasaka Family claims that Jokichi Tasaka invented Guri-Guri somewhere around 1920, way back in plantation days. Guri-Guri and I go back a long way...from what I remember my Mom told me that Guri-Guri(called Goodie Goodie in Honolulu) was one of the two items She craved while pregnant with me. 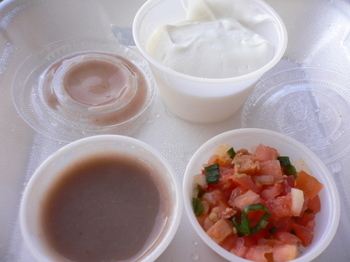 Being a good Maui Girl, I have no doubt that She craved Guri-Guri. If you really want to know, the other item She craved was Saimin....a yes, I wuz a noodle head, from da' beginning! 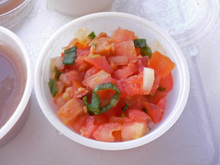 The Missus first had a version of Guri-Guri, called Goodie-Good at Cafe 100, during one of our many visits to Hilo when we had friends living there. I had always told Her that it was nothing compared to the "real thing" at Tasaka. So of course our first stop after picking up our rental car was Maui Mall and Tasaka Guri-Guri, which was quite busy, even during a mid-afternoon during a weekday. So what is Guri-Guri? Well, it's sort of a Sherbet. The flavor is sweet, and slightly milky. 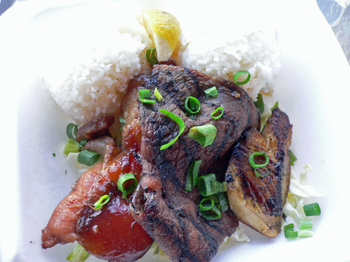 In fact Reid of Ono Kine Grindz even has a recipe, located here. The Tasaka Family recipe is a closely guarded secret. 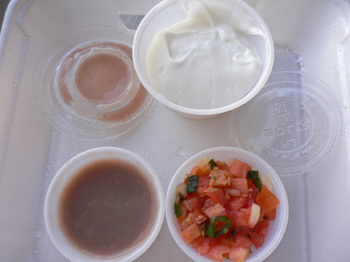 If you want Guri-Guri, you'll have to go to Maui, you won't find it in Honolulu. In fact, I've heard of people taking the 2 Quart "Cold Pack"($10) all the way back to the Mainland. I'm sure many of you are wondering, "what's the big deal, it's a sherbet". But it's not only a a frozen confection, it's a part of my childhood, part of a simpler time, and many generations of Kama'aina's are addicted to it. Hey, former President Clinton even stopped at Tasaka on His visit to Maui. Which I think would have been a quite interesting event.